Extra links to extend the length of prong collars. 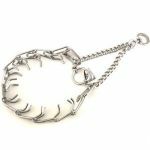 Micro Prong Collar - This Stainless Steel micro prong collar is 1.6mm and 9" around. Weighs under 1 1/2 ounces. This collar does not apply direct pressure to the trachea so you can train your dog with little or no tugging, jerking, or pulling. 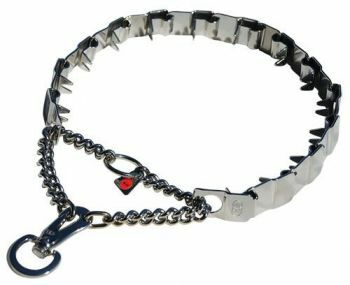 Features: -Interlocking links, each link equipped with two blunt prongs -Slips over dog's head for easy on, easy off -Slightly beveled, polished prong tips - Easy to increase or decrease size. Additional links are available for this collar. This collar is specifically designed for small breed dogs. This is not a Herm Sprenger product. 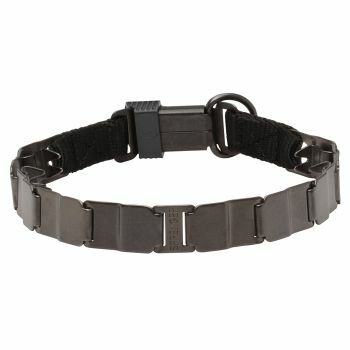 Option: You may add a Side Release Buckle to this collar. The addition of the center plate connector allows the middle link to be configured symmetrically, so they tighten in the same direction. This design improves the effectiveness of the training collar. Curogan is a copper-tin-alloy with a high copper portion and some additives which make the material strong - but without any nickel. More often nickel is responsible for allergic reactions of sensitive dogs and causes of some skin rashes. Herm Sprenger advises that the Curogan will NOT rust because it is a copper/tin alloy and does not contain any iron, and only iron can rust. Curogan will darken and tarnish when exposed to the outdoor environment. Measuring 19" or 24" in length with size being adjustable beyond that by easily removing or adding links as needed. Each link and new ClicLock buckle are stainless steel for maximum durability, even in wet or salt water conditions. Matt finish.